Resolution No. 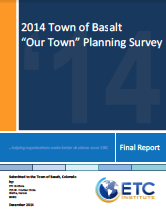 54, Series of 2014, established a Downtown Area Advisory Committee (DAAC) to help the Basalt Town Council determine plausible redevelopment scenarios for the Our Town Planning Area. The Resolution established that each Councilor would appoint a Committee member and the P&Z and Mayor’s Cabinet would each appoint two members, for a total of 10 members. * Out of Town appointment. Resolution No. 54, Series of 2014, established that up to 2 of the Appointments could reside out of Town. 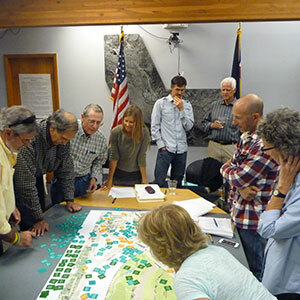 Meeting Time: 4:00 p.m. – 5:30 p.m.
Running concurrently with the DAAC meeting schedule, the Town has contracted with ETC Institute to conduct a scientific survey which will be mailed to every household in Basalt. 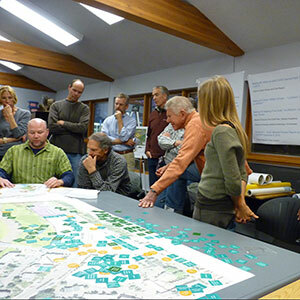 The survey asks about specific types of uses the community would like to see on the Pan and Fork, Clark’s Market, and Lions Park properties (See PDF Map). Results of this scientific survey will be used to augment and support the decisions of the DAAC as it reports back to the Town Council. 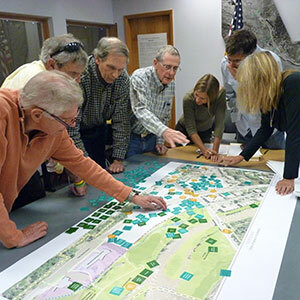 The Downtown Area Advisory Committee at work.